If you’re in your mid-20’s, 30’s, or even 40’s, you probably know someone who’s guilty of sharenting. It could be a friend, someone in your family, or maybe even you. As people share more about their life with the entire world, they also share cute/funny photos and videos of their child. Although it may not seem like it now, posting too many things about your child on social media could be detrimental to them and the rest of society. Social media networks like Facebook and Instagram don’t prepare you for the future, or tell you how social media posts about your kids could impact them later on in life. So we’re going to fill you in and tell you all you need to know about sharenting. What Is Sharenting (and Why Is it a Problem)? Sharenting (also known as oversharenting) is a term used to describe parents’ overuse of social media to share content of their children. 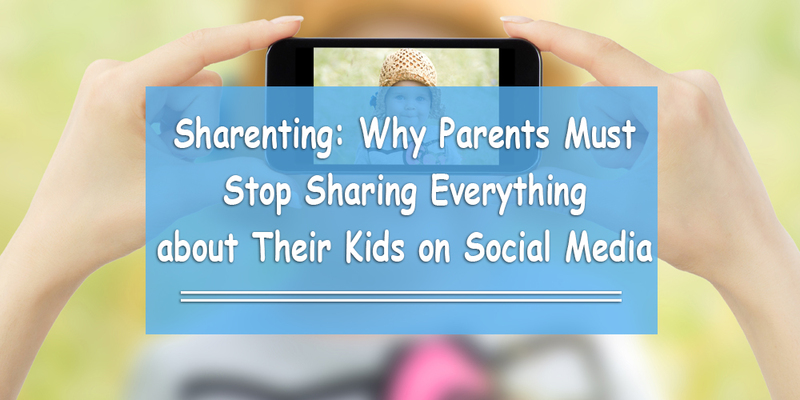 Combining the words ‘sharing’ and ‘parenting,’ sharenting happens when you share too much information. Now, you may be thinking that you don’t share too much information of your kids online (i.e. you just post the occasional picture of your baby sleeping, or your child’s birthday). Fun photos are nice to have, but research from the European Cyber Crime Centre says you should still take caution. Photos taken on digital devices contain hidden data, such as the time, date and location, and this data can be cracked and may place the child at risk. Even if you remove these threats and tighten up your privacy settings, these photos and videos become public property once shared online. Once they’re shared online, hackers and online predators can use those photos and do whatever they want with them. In extreme instances, parental sharing of children’s information has led to a new phenomenon called “digital kidnapping,” where people consume all the information you posted about your child and use it for malicious intentions. Some pretend your child is related to them, while others pretend they are the child. How Big Is the Sharenting Problem? Sharenting has been happening for a while, and it now happens everywhere around the world. However, it’s more relevant to those living in places where people have unlimited access to the Internet and the majority of the population uses social media. Take the Western World, for example. According to a 2010 survey conducted by AVG, 81 percent of children under the age of two years old currently have some kind of digital profile or footprint, with images of them posted online. 92 percent of American children already have an online presence at that age, compared to 73% of children in the EU5 (UK, France, Germany, Italy and Spain). Even more appalling, according to a 2015 survey by the University of Michigan C.S. Mott Children’s Hospital National Poll on Children’s Health, 51% of respondents said they had given out information that could be used to identify a child’s whereabouts. This makes it easier for predators to trace a child’s location. These things undoubtedly happen in the Arab World, as well. Contrary to popular belief, parents who share too much information about their kids on social media (a.k.a. sharents) do not necessarily do for it because they are self-centered. The #1 reason why they do it is because social media is a platform that makes them feel like they’re not alone and/or missing out in activities with their family and friends. In a world where we’re interconnected, raising a child can be isolating. Parents can’t do the same things they used to do when they were childless. By living through their child’s achievements, posting images and videos helps bridge the gap and share those joyful moments with family and friends. When she turned 18, she sued her parents for posting these photos on Facebook. According to news reports, the 18-year-old claims that her parents posted over 500 images of her childhood to over 700 people on social media. Her parents have refused to take the photos down, claiming that since they’re the ones who took the pictures he has the right to publish them. Their court date takes place in November 2016, and according to an Austrian lawyer, “[She] will win if it can be proven the photos violated her rights to a personal life.” Furthermore, the parents may end up having to pay compensation to their daughter as well as her legal costs. 1. Don’t post pictures, videos, or information of your child on social media that might compromise your child now or in the future. 2. Only post pictures and videos online that you wouldn’t mind any family member or friend posting on their own timeline; once you give someone access to your photo/video, they can do whatever they want with it. 3. Make sure all your social media privacy settings are set accordingly. 4. Don’t associate your child’s name with their birthday, school, address, phone number, or anything that you wouldn’t post on your own profile. 5. Turn off your geo-location service when taking pictures or videos on your phone. 6. If you have a child who is old enough to have discussions about online issues, ask them for their consent before you post a photo or video of them. Discover the Internet together! The take-home message is simple: think before you post. Be considerate of whether your child would like to see that picture on social media 10 years from now. We always tell our kids to think before we post. Parents (and all adults) should set the example by doing the same, as well. And with that, we leave you with this video about sharenting. I don’t think anyone has the right to post personal/sensitive content about their young children. It basically denies them of their individuality and anonymity for 1. 2nd, you say most people do it because they don’t want to be alone or miss out…… in other words these parents are insecure. Your percentages are also wrong. For example 81 percent of children under 2 have a digital footprint. No, 81 percent of children who”s parents use social.media have a footprint. 99 percent of the time someone is posting stuff about their children (or mother things) is seeking validation, otherwise they would be too busy living their fulfilling lives, and absorbing genuine relationships. Have distant relatives??? Send pics in the mail, or personal email, or facetime…it’s more personable. Social media is disingenuous and nothing more than a stage for someone to receive cheap attention, all under the guise of “communicating”.